Cylindrical high voltage resistors with proprietary non-inductive design, high precision, low temperature coefficient, low voltage coefficient, high stability, high temperature silicone coating. Cylindrical high voltage resistors with proprietary non-inductive design, high precision, low temperature coefficient, low voltage coefficient, high stability, epoxy coating. 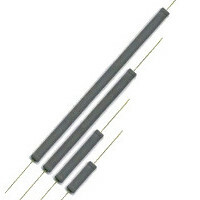 Cylindrical high voltage resistors with low temperature coefficient of 25 ppm/°C, non-inductive design, high precision, low voltage coefficient, high stability, silicone coating. 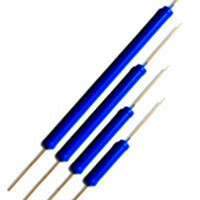 Cylindrical high voltage resistors with increased power rating, non-inductive design, high stability, extended operating temperature to 275°C, high temperature silicone coating. 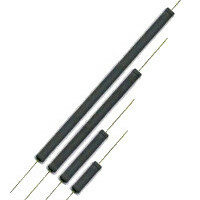 Cylindrical high voltage surge resistors with proprietary power film design, non-inductive, high stability, high pulse energy and high frequency, high temperature silicone coating. 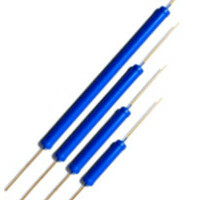 Cylindrical low cost high voltage resistors that meet a general set of requirements. These products are available with high temperature silicone or epoxy coating and feature a wide ohmic range.